What a great spot Marsk-by-the-Sea beach is. It’s an overlooked stretch of beach – the maddening crowds head for the Rock Stars of that area – Whitby, Scarborough and the like (which I’m not knocking, very nice.. but) we were after something a bit more as nature intended. Marske doesn’t boast amusement arcades, stick o rock shops – even so much as an ice cream van, yet the beach is spectacular. There’s a couple of car parks and that’s about it. A relatively quiet, beautiful sandy beach with amazing views. On a map, it looks like it might be ‘a bit too close’ to Middlesborough and Stockton (psst… it’s not). It’s just outside the North Yorkshire Moors National Park.. All this works in the favour of keeping the masses at bay perhaps. Anyway – we got there yesterday midday, swam, threw ball for dog, swam some more, threw ball for dog – you get the idea – and chilled. I then cranked up the beach BBQ and cooked meats for eats on the beach. Here’s the thing.. we wanted to camp over in the car park (in the van, pictured above). 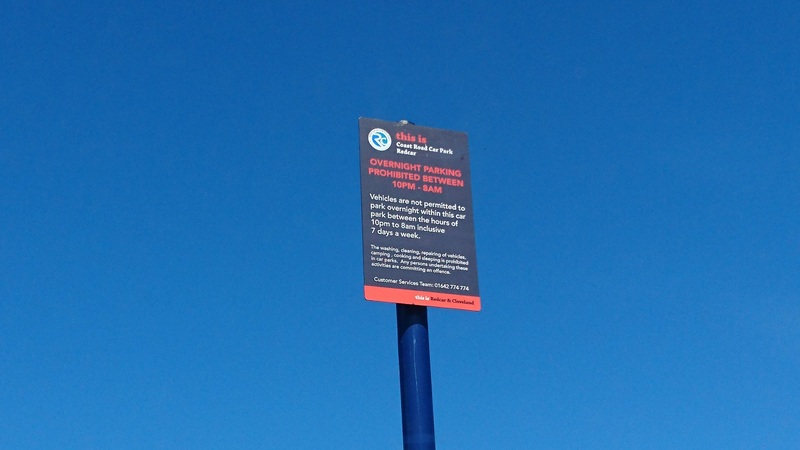 However, there were ugly signs saying OVERNIGHT PARKING PROHIBITED. 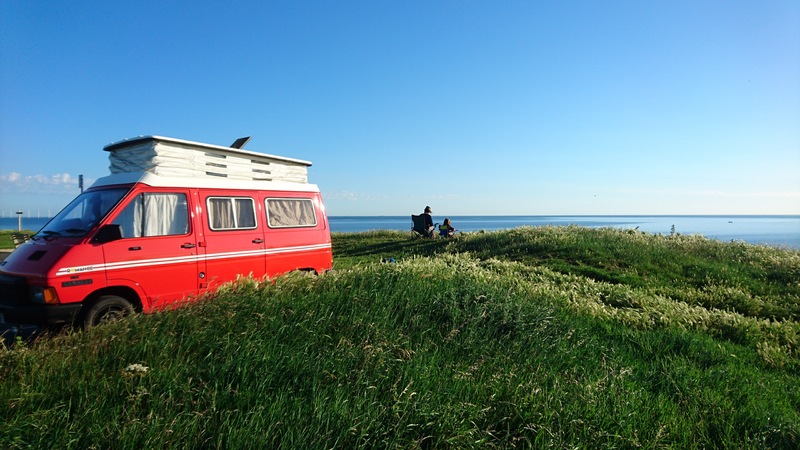 We simply wanted to spend 2 days on the same spot of beach and sleep over in our van whilst adhering to the ‘take nothing but photographs, leave nothing but footprints’ edict. Bit of a dilemma. We didn’t want to break any laws but we didn’t want to go to a campsite (no doubt would have struggled to find one that wasn’t booked up to the hilt on the hottest weekend of the year so far. But – the road behind the car park had a generous verge. There were already a couple of people parked up there looking liked they were settling in for the night, so we camped there – until we were ‘officially’ allowed back into the car park the next morning. A few bizarre heckles from (I guess) locals but I don’t think I broke any laws and they didn’t sound particularly official given their choice of diction and syntax. This was the only blot on another wise superb weekend and Fathers Day. I spoke with some long standing residents who said it was a shame but a bunch of Travellers ruined a patch of ground near the car park – left a lot of litter and abused the hospitality of the locals and mother nature by the sound of things. I also heard of people emptying their chemical toilets straight into the grass there (shame on them!). The locals petitioned the council, the council put up signs in the car park and barriers which in hindsight, seems to have simple pushed the people wanting to camp over there to a slightly different location that’s not adorned with ugly notices – ironically, closer to the village that the petitioners probably reside. The locals I spoke to also noted that it was a shame – they “missed a trick” in not welcoming potential overnight tourists with a bob or two in their pockets – even to the tune of a meal in the pub, a loaf in the morning, or (as some do) car park charges, etc. Anyway – aside from the blot, we’ve had a cracking weekend. Top spot, despite the ugly car park signs situation.